Recently we updated Google Profiles to help you decide what the world sees when it searches for you. Your profile and scrapbook photos already make it easier for people to get to know you, but we want to do more to help you showcase your favorite pics. Now you can add Picasa Web Albums to your Google profiles. By choosing to show the “PicasaWeb” tab, you will enable visitors to see your public albums. Private albums will remain visible to only the people you’ve shared them with directly. 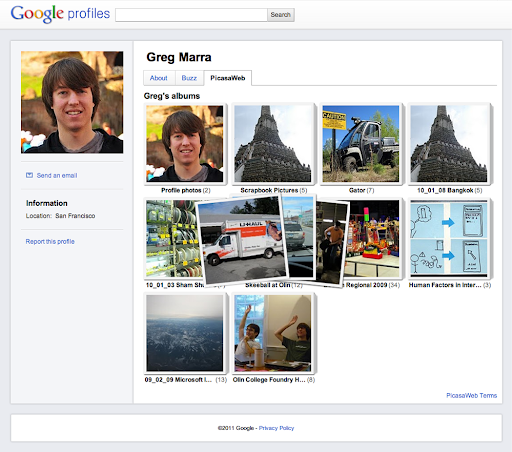 Add Picasa Web Albums to your profile now by visiting profiles.google.com. We hope you enjoy this change, and be sure to let us know what you think in our forum. Happy posting!